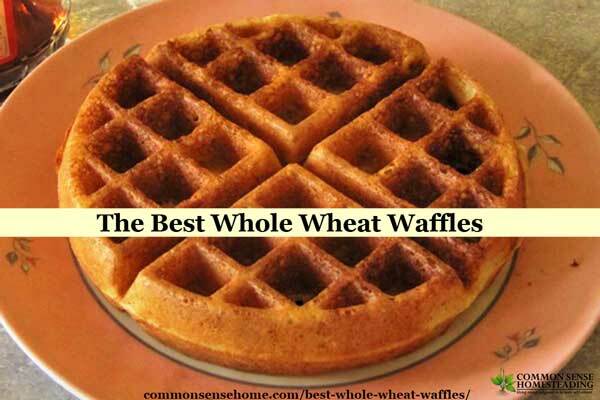 Looking for a recipe for homemade whole wheat waffles that's easy, tasty and kid-friendly? You need to try this! It's great for using up a bit of leftover yogurt, buttermilk or milk kefir, too. I've been making Katie from Kitchen Stewardship's Soaked 100% Whole Grain Pancakes for over a year now, and they are some of the best pancakes we've ever eaten. The cakes are moist and filling, and one batch makes enough pancakes for our family of four for at least two breakfasts. I often freeze extras and reheat them in the toaster oven as needed. Last Friday night I put my batter to soak for pancakes on Saturday. When morning rolled around and I told the boys I was planning pancakes, my youngest said he really wanted waffles. Nothing ventured, nothing gained, so I tried out the pancake batter in the waffle iron. Success! Crispy on the outside, tender on the inside, these waffles were wonderful with organic butter and local maple syrup. Sometimes I make cherry-berry sauce, too. Whisk together flour, milk product, water, and vinegar in a medium bowl (ceramic or glass preferred, no metal, plastic okay in a pinch – I use my 8 cup Pyrex measuring bowl) and leave on the counter, covered, to soak 12-24 hours. Just before cooking, add coconut oil, eggs, baking powder, baking soda and salt. 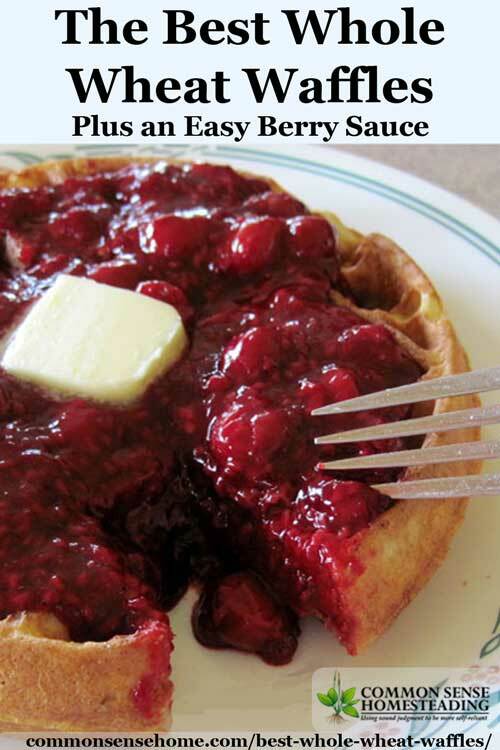 Place batter on waffle iron and cook for about 3 1/2 minutes for large round waffles. Makes about 6 1/2 waffles using 1 cup batter each. If you'd prefer to make pancakes, use 1/4 cup to 1/2 batter per pancake. Both are delicious. *Katie notes: “This recipe works with all regular whole wheat, is much better with half whole wheat/half pastry flour, and is best with all pastry flour. 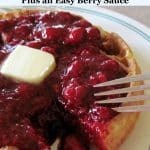 Pastry flour is more expensive, so I like to go 1/2 and 1/2 most of the time.” Freshly ground soft white wheat flour is my default choice, and it gives these whole wheat waffles a great texture. **Because you’re adding vinegar to the milk, it’s a “fake” buttermilk of sorts and I haven't had a problem with it sitting on my counter overnight. Raw milk would be safest for this if you choose to use milk. You can also use the dairy choice in place of the water for even richer pancakes. I have tried all three options, and I think the milk is the best one, but I often use homemade yogurt. Place fruit in medium heavy bottomed sauce pan. Make sure there is juice from thawing or mashing the fruit. In a small bowl, mix together sugar and cornstarch. Mix into fruit (mixing sugar and cornstarch before adding will prevent lumps). Heat until bubbling, stirring regularly. Cook gently until thickened (mixture should turn glossy). Remove from heat and stir in extract. Serve warm (will thicken as it cools). You can add more sweetener or less as you like. I bought my Presto FlipSide Belgian Waffle Maker about a year and half ago, upgrading from a small rectangular iron I used to have, and I'm glad to have made the investment. If you've even ordered Belgian waffles at a restaurant, you know they charge an arm and a leg for them. It paid for itself in a couple of breakfasts (plus, of course, I know what's in my waffles). My waffles cook much more uniformly, and any spills are much easier to clean up. Yes, it has a non-stick surface, but I don't rub anything against the surface and it stays at a uniform temperature, so the coating is much less likely to come off than in a frying pan. The iron has a timer, which helps avoid burnt waffles. Waffles are still a bit of a treat, but they are so much easier to make with the right equipment (and the BEST WAFFLE RECIPE EVER ;-). 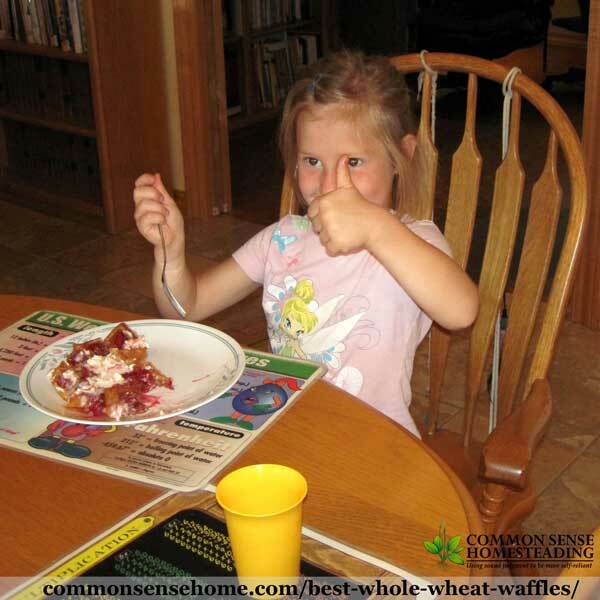 My sister brought her granddaughters to visit last summer, and they agreed, these were the best waffles they had ever tasted (even better than mom's – shhhh…). Originally published in 2011, updated 2016. My kids love waffles. I have to try this recipe next time. I need to learn how to make waffles like you do! Despite my efforts, it's always a huge mess of batter and a not-so-pretty waffle as the result. Do you think you could let the mixture soak hidden in the microwave? I wouldn't want to take chances if our kitty started overnight exploring. I kept mine on the counter overnight and the three cats didn't bother it at all (and I know they sneak up on the counter sometimes), but I don't see why you couldn't hide it in the microwave just to be safe. I have yet to attempt made from scratch pancakes, or waffles for that matter. I am think I may give it a try with this recipe, thanks! Shawntele – thanks for stopping by. This recipe is super easy and freezes well, too. I haven't purchased mix in several years. I just made waffles to freeze today! It's so nice to be able to just pop them in the toaster oven for a quick breakfast. Do you mix the flour, milk, vinegar, and water with a spoon? Or just let it all sit in the bowl unmixed? I mixed mine and they came out just fine so I guess it doesn’t really matter. My husband even liked the pancakes! I didn’t explain the whole soaking process until AFTER he ate them though. lol. Mr. “I Grew Up Eating Log Cabin Syrup” even liked the raw honey I served with them. I measured out the batter in a half cup. One full cup was a huge pancake! I have sever left over to freeze and will soak more batter tonight to make waffles. I just made the starter batter but I did not have whole wheat pastry flour so I used 2 cups whole wheat flour and 1 cup unbleached bread flour, hopefully they will turn out ok.
Any suggestions on how to add veggies to this batter? Like spinach or squash? I have no idea how much to add, and/or how it would change any other components of the recipe. But would love to add some “hidden” veggies for my very picky 2 year old. Thanks!! This recipe is easy to make and delicious! This both economical and budget friendly. It makes you want to grab some more! If the kids love it, you know that you’re doing it right!